To celebrate and advocate excellence in the liberal arts and sciences. The Phi Beta Kappa Society (ΦΒΚ) is the oldest honor society for the liberal arts and sciences in the United States, with 286 active chapters. Widely considered to be the nation's most prestigious honor society, Phi Beta Kappa aims to promote and advocate excellence in the liberal arts and sciences and to induct the most outstanding students of arts and sciences at American colleges and universities. Founded at The College of William and Mary on December 5, 1776, as the first collegiate Greek-letter fraternity, it was among the earliest collegiate fraternal societies and remains the oldest existing American academic honor society. Phi Beta Kappa (ΦΒΚ) stands for Φιλοσοφία Βίου Κυβερνήτης or in Latin letters Philosophia Biou Cybernētēs, which means "Love of learning is the guide of life". According to Phi Beta Kappa, they have chapters in about 10% of American higher learning institutions, and about 10% of these schools' Arts and Sciences graduates are invited to join the society. Although most students are elected their senior year, many colleges elect a very limited number of extremely select students in their junior year, generally less than 2% of the class. Each chapter sets its own academic standards, but all inductees must have studied the liberal arts and sciences, demonstrated "good moral character", and, usually, earned grades placing them in top tenth of their class. There is a mandatory initiation fee (between US$50 and US$90, as of 2005), which is sometimes covered by the inductee's university. 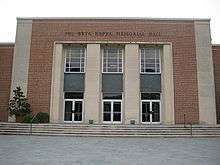 Present day Phi Beta Kappa Memorial Hall entrance at The College of William & Mary. The Phi Beta Kappa Society was founded on December 5, 1776 at the College of William and Mary in Williamsburg, Virginia, and established the precedent for naming American college societies after the initial letters of a secret Greek motto. There had been earlier fraternal societies at the College, but these, including the well-known F.H.C. Society (nicknamed "the Flat Hat Club"), founded in 1750, were Latin-letter societies: their names were taken from initial letters of a secret Latin motto. William and Mary alumnus and third U.S. President Thomas Jefferson was perhaps the most famous member of the F.H.C. ; other notable members of the original Society included Col. James Innes, St. George Tucker, and George Wythe. Jefferson noted that "When I was a student of Wm. & Mary college of this state, there existed a society called the F.H.C. society, confined to the number of six students only, of which I was a member, but it had no useful object, nor do I know whether it now exists. ":5 The best opinion is that the society did not survive the invasion by British forces during the Revolution. A second Latin-letter fraternity at William and Mary was the P.D.A. Society (publicly known as "Please Don't Ask"). John Heath, chief organizer of Phi Beta Kappa, according to tradition earlier sought but was refused admission to the P.D.A., though he may instead have disdained to join it (Heath's friend and fellow student William Short later wrote that the P.D.A. "had lost all reputation for letters, and was noted only for the dissipation & conviviality of its members":84). The new society was intended to be "purely of domestic manufacture, without any connexion whatever with anything European, either English or German. ":84 The founders of Phi Beta Kappa declared that the society was formed for congeniality and to promote good fellowship, with "friendship as its basis and benevolence and literature as its pillars." Like the older, Latin-letter fraternities, the Phi Beta Kappa was a secret society. To protect its members and to instill a sense of solidarity, each had the essential attributes of most modern fraternities: an oath of secrecy, a badge (or token) and a diploma (or certificate) of membership, mottoes (in the case of the Phi Beta Kappa, in Greek rather than in Latin), a ritual of initiation, a handclasp of recognition; to these, the Phi Beta Kappa would soon add another attribute, branches or "chapters" at other colleges. The new society was given the motto, Φιλοσοφία Βίου Κυβερνήτης or in Latin letters Philosophia Biou Kybernētēs, which means in English The Love for Knowledge be the Guide of Life. Greek was chosen, because Greek was in Roman times the language of science like Latin in medieval times. The Phi Beta Kappa Society National Headquarters located in the historic Dupont Circle neighborhood of Washington, D.C.
Before the British invasion of Virginia forced the temporary closure of the College of William and Mary and disbandment of the Phi Beta Kappa there early in 1781, Elisha Parmelee, an alumnus of Yale College and Harvard College, passed through Williamsburg and took charters from the Phi Beta Kappa to establish branches of the society at these schools. A second chapter was founded at Yale College in late 1780; a third, at Harvard College in 1781; and a fourth, at Dartmouth College in 1787. From these new chapters, the Phi Beta Kappa evolved from a fraternity with principally academic and some social purposes to an entirely honorary organization recognizing scholastic achievement. While the Phi Beta Kappa developed some of the characteristics which still distinguish Greek-letter fraternities, it was left to other students to fill the natural human need for fellowship with kindred students by extension of fraternity to a purely social context. Further chapters appeared at Union College in 1817, Bowdoin College in 1825, and Brown University in 1830. The original chapter at William and Mary was re-established. In 1831, the Harvard chapter publicly disclosed the fraternity's secrets during a period of strong anti-Masonic sentiment. The first chapter established after the Phi Beta Kappa became an "open" society was that at Trinity College (Connecticut), in 1845. In the pre-Civil War period Society chapters frequently sponsored addresses by distinguished speakers. Ralph Waldo Emerson's 1837 address at Harvard, "The American Scholar" is the best-known of those addresses, but there were dozens of others at schools such as Bowdoin, Brown, Harvard, Union, and Yale. As the first collegiate organization of its type to adopt a Greek-letter name, the Phi Beta Kappa is generally considered a forerunner of modern college fraternities as well as the model for later collegiate honorary societies. Ironically, it was partly the rise of true "social" fraternities modelled after Phi Beta Kappa later in the nineteenth century which obviated the social aspects of membership in the organization, transforming it into the honorary society it is today. By 1883, when the United Chapters of Phi Beta Kappa was established, there were 25 chapters. The first women were elected to the society at the University of Vermont in 1875, and the first African-American member was elected at the same institution two years later. In 1885, however, Phi Beta Kappa eliminated those majoring in engineering from eligibility. This practice continues today. Each chapter is designated by its state and a Greek letter indicating its position in the order in which that state's chapters were founded. For example, Alpha of Pennsylvania refers to the chapter at Dickinson College, founded in 1887; Beta of Pennsylvania, the chapter at Lehigh University (founded later that same year); Gamma of Pennsylvania, the chapter at Lafayette College (1890); and Delta of Pennsylvania, the chapter at the University of Pennsylvania (1892). By 1920, a total of 89 chapters existed at a variety of schools. New chapters are continually added; as of 2007 there were 276. In 1988, the United Chapters of Phi Beta Kappa officially changed its name to The Phi Beta Kappa Society, recalling the name under which the organization had been established in 1776. The symbol of the Phi Beta Kappa Society is a golden key engraved on the obverse with the image of a pointing finger, three stars, and the Greek letters from which the society takes its name. The stars are said today to show the ambition of young pupils and the three distinguishing principles of the Society: friendship, morality, and learning. On the reverse are found the initials "SP" in script, which stand for the Latin words Societas Philosophiae, or "Philosophical Society". The "key" of Phi Beta Kappa did not begin as a copy of a watchkey. The first insignia was in fact a larger, cut-and-engraved silver medallion, essentially a square of metal with a loop cut integrally with the body of the square from the same sheet of silver, in order to allow for suspension from one or two ribbons worn around the member's neck in the manner in which the older fraternities (and the Freemasonic bodies on which the collegiate societies were in part patterned) wore their own insignia. Later, the size of the medallion was reduced and men took to wearing the insignia on their watch chains as fobs. The post or stem, designed for the winding of pocket-watches, did not appear on fobs until the beginning of the 19th century. The fobs were not even gold at first; the earliest extant 18th-century models were made of silver or pewter, and again it was not until the first quarter of the 19th century that gold largely supplanted the use of silver or pewter. Some notable exceptions did occur, as at Harvard, which until the first decade of the twentieth century continued the use of silver or pewter for some of its keys. Though several stylistic details have survived since the earliest days—the use of the stars, pointing hand, and Greek letters on the obverse, for example—notable differences exist between older keys and current examples. The name of the recipient was not engraved on the earliest fobs or keys, and was not until the first decade of the nineteenth century. The name of the school from which the fob or key came was also not routinely included on the earliest models, and sometimes the only way to trace a key to a particular school's chapter is by researching the name of the recipient against surviving class records. The number of stars on the obverse has also changed over the years, with never fewer than three, but on some known examples with as many as a dozen (the explanation as to the meaning of the stars in these early cases varies from chapter to chapter). Also, the date of the awarding of the honor is only seen on keys from the second quarter of the nineteenth century onward (some people mistake the date that appears on the fob or key—December 5, 1776—as the date that a particular fob or key was awarded, when in fact it is merely the date of the founding of the society). Only in 1912 was the key made to a uniform standard of size, golden appearance (some are plated), and engraving with the school's name, recipient's name, and date of the award. The Phi Beta Kappa Society publishes The Key Reporter, a newsletter distributed quarterly to all contributing members and biannually to all other members, and The American Scholar, a quarterly subscription-based journal that accepts essays on literature, history, science, public affairs, and culture. Phi Beta Kappa also funds a number of fellowships, visiting scholar programs, and academic awards. The Phi Beta Kappa Book Awards are the Ralph Waldo Emerson Award, the Christian Gauss Award, and the Phi Beta Kappa Award in Science. Phi Beta Kappa has 284 chapters. Chapters are approved at the Triennial Conventions. Since inception, 17 U.S. Presidents, 38 U.S. Supreme Court Justices, and 136 Nobel Laureates have been inducted members. In 2008, the Phi Beta Kappa Society was awarded the Arts and Sciences Advocacy Award from the Council of Colleges of Arts and Sciences (CCAS). CCAS bestows this award upon an individual or organization demonstrating exemplary advocacy for the arts and sciences, flowing from a deep commitment to the intrinsic worth of liberal arts education. 1 2 "Archived copy". Archived from the original on 2016-11-06. Retrieved 2015-03-17. ↑ Warren, John (2000). "Historical Information". Association of College Honor Societies. Retrieved 2009-03-10. ↑ "About Us". Phi Beta Kappa. Retrieved 22 January 2012. ↑ "Stipulations Concerning Eligibility for Membership in Course". Phi Beta Kappa Society. 1 2 Nancy Keates (4 Nov 2005). "Phi Beta What?". The Wall Street Journal. Retrieved 7 September 2014. ↑ Brinkley, M. Kent Brinkley (March 1, 1999). "Freemasonry in Williamsburge: An Overview History of Williamsburg Lodge #6, A.F.& A.M. of Virginia". Williamsburg, Virginia: Acacia Lodge No. 16 A.F.&A.M. 1 2 3 4 5 6 7 8 9 Hastings, William T. (1965). Phi Beta Kappa as a Secret Society with its Relations to Freemasonry and Antimasonry Some Supplementary Documents. Richmond, Virginia: United Chapters of Phi Beta Kappa. ↑ Fleming, Bill (May 6, 1996). "Phi Beta Kappa". Brief History of Fraternities. Sam Houston State University. Retrieved October 26, 2015. 1 2 Millfield, Becca (November 2, 2004). "Shhh! The Secret Side to the College's Lesser Known Societies". The DoG Street Journal. The College of William & Mary's daily online. ↑ "F.H.C. Society," University Archives Subject File Collection Archived January 15, 2009, at the Wayback Machine., Special Collections Research Center, Earl Gregg Swem Library, College of William and Mary. 1 2 Robert W. Storm, "In Token of Friendship: Early Fraternity Medals at the College of William and Mary"; 1973; typescript in university archives, Earl Gregg Swem Library, College of William and Mary, Williamsburg, Virginia. ↑ Alfred L. Brophy, The Rule of Law in College Literary Addresses: The Case of William Greene, Cumberland Law Review Archived March 29, 2016, at the Wayback Machine. (2001) 32: 231-85. ↑ "About Chapters". The Phi Beta Kappa Society. Retrieved 2013-11-26. ↑ Phi Beta Kappa Society :: Phi Beta Kappa Society Archived January 13, 2015, at the Wayback Machine.. Pbk.org (2012-10-05). Retrieved on 2013-08-27. ↑ "Arts & Sciences Advocacy Award - Council of Colleges of Arts and Sciences". www.ccas.net. Retrieved 2016-05-02. "Phi Beta Kappa". The New Student's Reference Work. 1914.